Facebook isn’t just for friends and family. The social media giant is a great resource for growing your business online. What began as a social hangout has evolved into a powerhouse for business pages, paid advertising, shops, and more. Here’s a comprehensive guide to Facebook for real estate. Why is Facebook Important for Real Estate Agents? Facebook is concerned with user experience AND with revenue. The social network has created all new ways to market your real estate business digitally. Although no longer a primarily free resource for gaining traffic for your business, Facebook is still a remarkable tool for business growth, brand awareness, networking, and advertising. Facebook business pages are secondary digital calling cards, following your real estate website. Through the use of cover images, contact information, the about section, photos, and updates, you can enhance brand awareness and encourage audience engagement. User engagement is what catapults your profile into high ranking status. Everyone’s on Facebook, right? Okay, not everyone, but there’s no disputing that Facebook is a social media giant that packs a powerful punch. Does that mean you should have a Facebook business page for your real estate business? A few years ago, that answer would have been a resounding yes. But Facebook business pages have lost their clout and there’s debate over whether or not they hold any value in today’s market. Still, there advantages to weigh against the disadvantages of maintaining real estate Facebook pages. Your number one reason for using Facebook for real estate is to create brand awareness. Use a professional profile image, design a cover image with your logo and catchphrase, pop in your contact info, and allow your brand to expand on the social network through posts, and more importantly, through engagement. Unless you point a visitor directly to your Facebook business page, your page may be difficult for viewers to find. It used to be that when someone liked a post on your page, that post would then be shared on that person’s page for their friends to see. The more likes your page received, the more often your page would be displayed. Such is not the case anymore. In fact, with Facebook’s recent algorithm changes, only a teensy tiny percentage of posts are actually seen, and are shown to an even smaller percentage of viewers. However, Facebook does offer a search feature. If a viewer types “Real Estate Agent” into the Facebook search, they’ll find a statistic similar to: 91,502 people are talking about this. Below that statistic are lists of groups pertaining to real estate. But when a viewer types the words “real estate agent” into the search bar and then hits return or enter, the first results on the page are for real estate agents in the area. Boom. Furthermore, when a business page is set up correctly with contact information, Facebook makes it easier than ever for prospects to contact you with the tap of a finger without ever leaving the Facebook app. Your Facebook page is a perfect place to share links to your blog posts, youtube videos, or fun and funky memes pertaining to your industry that might provoke those all mighty likes and shares. Although not as powerful as organic search results, every page view supports the goal of website traffic. For this reason, if not for any other, your Facebook page is a great way to let your fans and followers know you’ve got new goodies to offer. If you don’t have a real estate Facebook page where you stir up activity, you’ve got no chance whatsoever of another person sharing your page’s posts. You’ve nipped that social sharing in the bud. A fabulous way to begin your tracking and measuring is with Facebook Insights. Find out who likes your page, how often your page is visited, where your audience is coming from, which days or times of day are more popular, and which of your posts are the most powerful. Learning to gauge your traffic is crucial to your marketing endeavors. Facebook has a ton of pull in the search engines. Search queries for a person or page often show Facebook in the top results. Even if you’re not actively posting or engaging on Facebook, the act of setting up a business page with your contact information could get you in front of viewers faster. Look. Take ten minutes to create a page. There’s zero investment. It costs nothing. Nada. Zilch. Ultimately, aside from that ten minutes invested in setting your page up, you’ve got absolutely nothing to lose. By setting your page up, you’re allowing your business to be one of the thousands found on Facebook through Facebook search. You’re making it easy peasy for prospects to get in touch with you with minimal effort. You’ll pull a little extra weight in the search engines, and have the opportunity to explore insights. And if you’re super zealous, you can jump right in with engagement by posting images, videos, links, polls, and live broadcasts. Facebook opens up a world of possibilities for getting your name or your brand recognized. One of the most popular methods of reaching a target audience is to create a Facebook page and begin building a fan base. 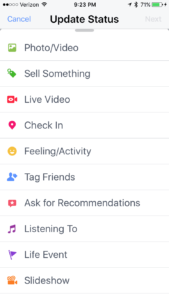 There are six main categories to choose from when you decide to create a page on Facebook. Each category is broken down into numerous sub-categories to refine your target. Before you can choose which page type is perfect for your needs, let’s take a look at each category. This page is excellent to use if you have a physical location for your business. The sub-categories include things like airports, attractions, bars, book stores, pet services, and real estate. Let’s say that you own a real estate office downtown and want to encourage people to visit the office and seek your services, this page would be a good choice. You would choose the sub-category of real estate. People will have access to your address and phone number, but it will also include information such as business hours and parking requirements. One benefit to using this type of page for your business is that it has a feature that allows customers to check-in when they visit the actual location. This has an amazing reach because it will post the check-in on your page, their timeline and show up on their friends’ feeds. This is an effective way of spreading the word about your business location. This page is well suited for people who run a business that is mainly handled online or does not have a physical location that customers can visit. There are sub-categories like company, small business and non-profit organization. If you’ve recently opened up a real estate office in your home or you happen to have several physical locations for your offices, choosing this page with the sub-category small business or company would be a good choice. This page is used to promote brand or product recognition. There are sub-categories like cars, home decor, website, and product/service. Unless you are trying to promote a website, chances are you would not choose this for your page category. As an agent or real estate business, there are better choices. This page is has a lot of flexibility. There are sub-categories like artist, author, athlete, entrepreneur, business person, fictional character, and public figure. This is a popular choice for real estate agents and other business people because it builds a fan base of possible clients. Choosing this page with the sub-category business person would be a good choice. An added benefit to choosing this type of page is that it gives you an opportunity to stay connected with professional colleagues without having to add them as friends to your personal Facebook profile if you prefer to keep that for close friends and family. You might think that as a real estate professional you wouldn’t have any need for this category when considering your choices. This may be true for most people, but keep it in mind for publishing projects. Two of the sub-categories for this type of page are books and magazines. Let’s say you write a book or e-book and want to spread the word to increase sales. This would be the perfect page with the sub-category book chosen. Similarly, you may decide to publish a magazine for your real estate group. This page would be the natural choice for promotion. For general use, this wouldn’t be your choice for a page. However, there are times when this type of page would be beneficial for use. A good example for this would be your real estate team getting together to support or raise awareness for a cause. Getting the word out to build support for a charity marathon in which your team is running to raise money would be an excellent use of this page. Now that you know a bit about each type of page that Facebook offers, you can make a more informed choice about which type meets your needs. Keep in mind that if your focus changes after a period of time, you have the ability to edit your category. It’s better to choose wisely from the beginning, but knowing that you can switch things around if needed should offer a bit of comfort and take away some of the anxiety of the initial creation of the page. If you have a personal profile, find the “Create a Page” option in the lower section of the left-side navigation area. If you do not have a profile, visit Facebook.com and select “Create a Page” from the lower right hand area, beneath the option for “Create an Account”. When you select the category for your Facebook Page, you’ll need to enter a bit of information to personalize the page. To continue, you’ll need to read and agree to the Facebook terms of service for business pages. To learn more about setting up a Facebook Business Page, visit Facebook’s tutorial. Facebook ads are a great way for a new or experienced real agent (or business professional of any kind) to reach a new audience or reach back out (retargeting) to an existing audience or list. With proper testing and measuring at the campaign level, ad set level, and ad level, one can truly take advantage of an advertising platform that is still underutilized (especially in the real estate industry). Facebook presents such a huge opportunity for businesses to catch the attention of customers while simultaneously building on their brand image. Online marketing through Facebook enables businesses to connect with customers easily by building loyalty and facilitating word of mouth. This social tool enables you to create an engaged community and develop a dynamic web presence for your business. Facebook has announced a great feature, and that is a Facebook video profile. This feature allows you to customize how you represent yourself or business by filming a seven-second clip within the Facebook app, which shows up as the profile pic when people visit it. For starters, you will need to download the Facebook app for iOS and restart the browser. It has to be downloaded as the feature cannot be accessed using the phone browser. Log in to the app using your existing details and connect to your profile. If the feature is available, you should see a flashing icon of a video camera in the middle and a normal camera at the bottom right edge of your profile picture. Tap at your current profile picture that now appears at the middle and you can opt to take a new profile video or use the one you made earlier by selecting upload video or photo. If you select the take a new profile video, you will be automatically be taken to a camera mode where you can get to record a short video that lasts for a maximum of seven seconds. Remember to shoot the video in a horizontal mode otherwise it will appear sideways on your profile. If you are uploading an existing video from your device, note that Facebook will not accept it unless it’s less than seven seconds long. Therefore make sure that the clip isn’t too long otherwise you will have to trim it using the iPad’s or iPhone’s video editing software. Finally, choose the frame you will want to use to preview the profile video. Flip your profile by using this incredible tool to engage your customers, fans and friends on a more personal level. There’s more than likes and shares in using Facebook for real estate. People searching for businesses or services online have learned the language of reviews. Before they conduct business, they read the reviews others have left about that company or service provider. Likewise, when they’ve completed conducting business, consumers are inclined to leave reviews. Furthermore, when a client leaves a review on your Facebook page, they also have the option to leave comments, share testimonials, and tell stories of their experience. Not only do reviews help in word-of-mouth advertising and trust-building, but they can also lend power to search engine rankings. Google is now displaying ratings on its search engine results pages. It’s good practice for you to invite ratings and reviews whenever possible. You can include the link to your reviews page in the bottom of email correspondences, ask outright in the body of an email, or verbally ask your clients to leave you a five-star review on your Facebook page. Automated content publishing software such as Hoot-suite or Co-schedule may offer some benefits of convenience, but did you know you can schedule native Facebook posts in advance? Best practice suggests making three posts per day on Facebook business pages, at various times throughout the day. One may be to promote a blog post, one may be to raise brand awareness, and a third may be to feature a product or sale. When posting direct to Facebook, you can enter a link to your blog and Facebook will automatically pull the featured image and a bit of the text. However, search engines tend to favor native images. To accomplish this, save the featured image to a file on your computer. Upload the image to a Facebook post. From the blog post, highlight and copy a compelling bit of text to prompt action. That arrow drop-down feature allows you to select a future date and time for publishing your post. So you don’t need to make a practice of logging into Facebook three times a day to make a unique post. Instead, you can possibly select one day of the week to schedule the entire week’s worth of posts, or schedule even further out in advance. Facebook Live takes video to the next level. Once upon a time, you could record a video, then upload that video to Facebook. Now, Facebook allows live broadcasting. Facebook Live promotes user engagement as well as giving you an opportunity to provide value to viewers. Providing value to visitors should be your number one priority. If all you’re doing is announcing open houses or promoting your listings, your live posts will begin to appear as advertising, causing viewers to lose trust in or ignore your posts. Automobile dash-cam for driving tours of the neighborhoods. Another fabulous place to garner ideas for live videos are your clients! Whenever a client asks you a question, make that question and answer the subject of a Facebook Live broadcast. As a bonus, when users like, comment, or share your video during or AFTER you broadcast, the engagement keeps your video in the feed longer where it’s seen by a wider audience. Additionally, you can access the embed code or download your Facebook Live video and upload that video to YouTube or use it in a blog post. Furthermore, you can send that video by email to your entire buyer/seller audience in your database to build trust and provide value. To create high-quality in-house Facebook Live videos to promote your real estate business, you don’t need to spend a fortune on fancy equipment. A simple ring light, an iPhone, and a tripod can get you streaming live like a pro in no time. Choose the option for Live Video. Next, you’ll have the option to provide a description for your video, and to select your audience as Public, Friends, or Friends except, Specific friends, or private so that only you can see the video. You can post or read comments during your live broadcast, as well as view likes as hearts and thumbs-up icons across across the screen. When the video is finished broadcasting, you have the option to delete or post the video. Posting the video allows the recorded video to be played time and time again on your timeline, as well as allowing continued engagement in the way of comments, likes, and shares. As a bonus, every time a viewer engages with your “recorded live” post, that post is moved back to the top of your timeline feed where it becomes visible again to a broader audience. First, find the Video URL. 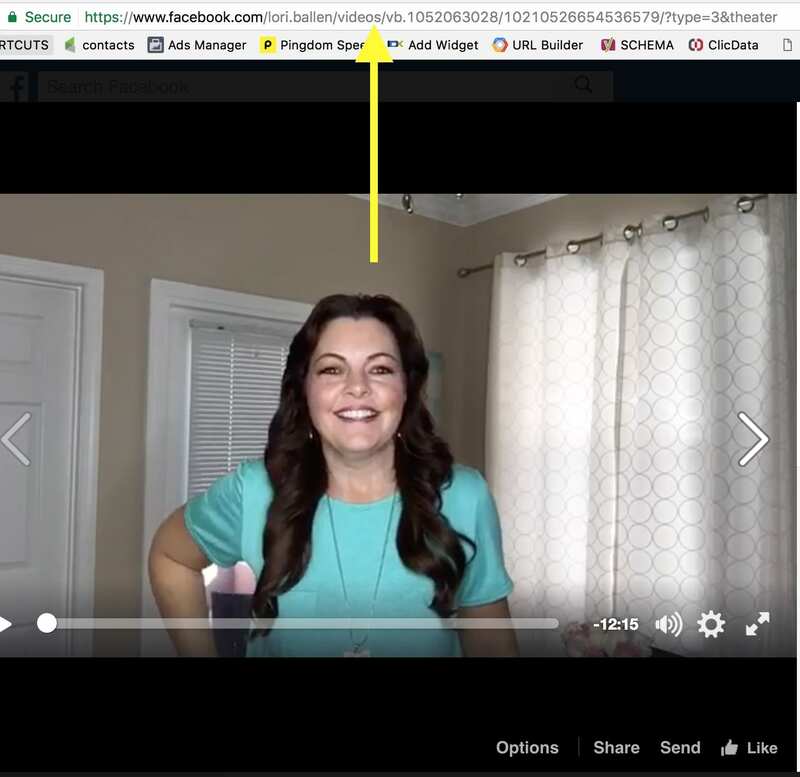 If you can’t find it, click on the date stamp on your Facebook Post and it will open the video in a new tab or window and should display the URL. Next, Replace the www with the letter M as in Mobile. 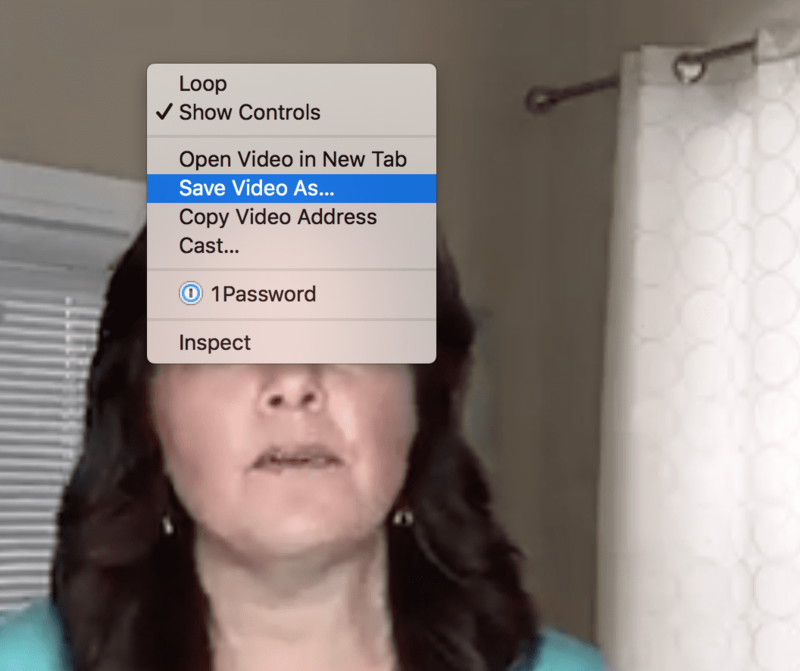 Right Click and Choose Save Video As. You’ll now be able to name it and save it as a MPEG-4 which you can upload to another website such as Youtube. Should you create a page, a group, or both? Generic Facebook Pages are easier to manage if you do not have the time to manage multiple pages. Generic pages will typically gather more followers rather than a brand page. An example of a Generic page would be our Summerlin Community Facebook Page. The more hyper-local you go, the more likely you are to gain followers for the types of customers you want. Ex: The Summerlin Community Facebook Page tends to have people who live in Summerlin as followers, so if you get a lead, it’s more than likely the type of lead that you want. 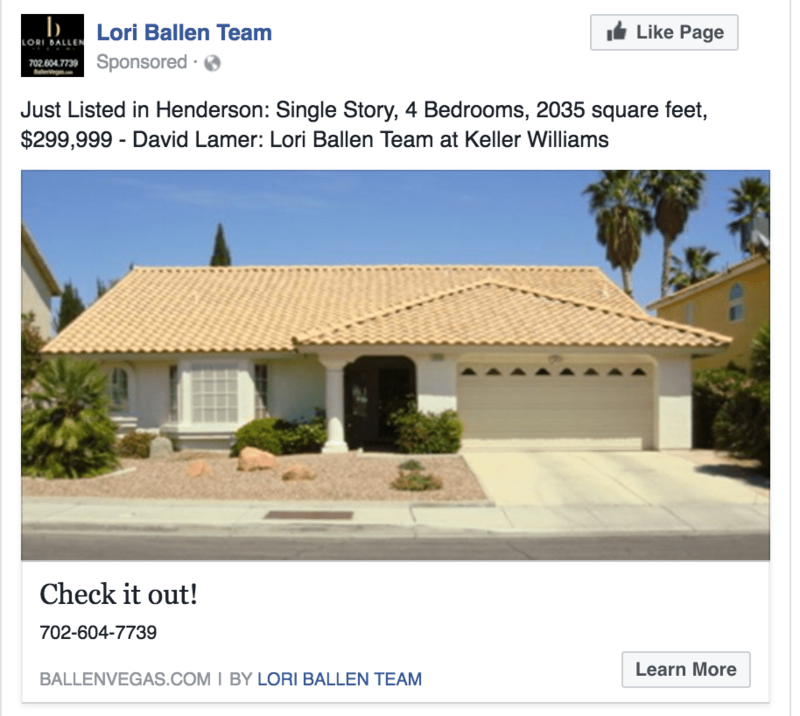 Business Facebook Page is for your specific business, such as The Ballen Group Las Vegas Facebook Page. This allows users to also write reviews for your business. When adding the post, choose the BEST photo FIRST, since that will appear as the biggest photo when viewers see the post. Add features that make the post stand out. Place a TRACKING URL on the post so that you know where the lead came from. To go one step further, create the Google URL FIRST, then use THAT URL in Bit.ly, since Bit.ly is simply a redirect to the page, rather than showing up as a custom URL that is easier to track. What Makes Groups So Valuable? We have heavy no-tolerance rule. If someone is spamming, you can delete the post and ban them from the group permanently, so that they cannot return. People feel that the group is for them, which gives them more incentive to post. Members: Other Real Estate Agents who are digital marketers. Why? They have something in common OTHER than real estate, which creates a stronger bond. Driving traffic to your Facebook page isn’t as easy as it once was. Furthermore, the status updates or image posts are only seen by a teeny-tiny percentage of your over-all followers. Rarely does a Facebook user search for a real estate agent by name, unless that agent was recommended by another Facebook user. However, creating Facebook Groups is a way to encourage networking, create lists, gain referrals, and provide value. You can also ask the group members for their input to those lists. 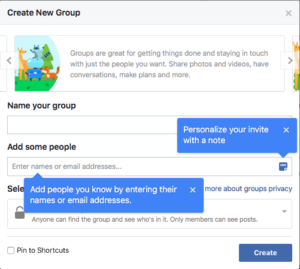 The people joining your Facebook group become your tribe. You’re building trust, creating value, and it’s highly likely those group members will either use your services or refer you as an expert in your industry when the time is right. A word of caution: When naming your groups, beware of using trademarked verbiage. Using a trademarked title in your group’s name could lead to having to add a related admin, renaming the group, or having to forfeit the group altogether. There are two ways to create a group. The first method is to scroll down on your home page to the area that says, “Create a: Ad, Page, Group, Event, Fundraiser” and select “Group”. Additionally, you can visit the “groups” section from your main page, then select “Create Group” from the top of the page. Once you select “Create a Group”, enter the name for your group, select the privacy settings, and add group members. Use the “Add some people” feature sparingly. In the case of auto-adding someone, it’s better to ask permission than forgiveness. Related Article: Real Estate Promotion | Got Swag? It’s now very simply to add products to the Facebook Marketplace. This is your Facebook business pages “shop”. Using a real estate agent as an example, you could add each new listing to your shop until it’s sold. Facebook is one of the most prominent forms of social media in the world. According to their website, Facebook has an average of 864 million daily active users, with approximately 82.2% of those users being outside of the United States and Canada. “Due to the fact that Facebook has chosen to involve software that will allow the theft of my personal information, I state: at this date of January 5, 2015, in response to the new guidelines of Facebook, pursuant to articles L.111, 112 and 113 of the code of intellectual property, I declare that my rights are attached to all my personal data drawings, paintings, photos, video, texts etc. published on my profile and my page. For commercial use of the foregoing my written consent is required at all times. There are many statements within this text that are just inherently incorrect. Although the language sounds very authoritative and probably makes you look twice to make sure you aren’t missing something, they are just words. With some research, one would reach the following conclusions. Facebook does not and would not choose to involve software that is allowed to steal personal information. In fact, Facebook has strict guidelines that regulate how others can use your pictures and other information. Even when adding an application or game to your Facebook account, you must specifically allow that app or game to access your personal information. The post sounds so official because it claims Facebook is infringing upon certain rights set forth in different codes, statutes and articles. But just because it sounds official, doesn’t mean that it is. For example, UCC 1-308 1-308 1-103 has no relevance to social media. It is a Universal Commercial Code having to deal with commercial transactions between states. The Rome Statute and ‘articles L.111, 112 and 113 of the code of intellectual property’ are also just not pertinent. This particular post calls Facebook an “open capital entity”, referring to the fact that Facebook is now a publicly traded company. All that means is that one can now buy stock in Facebook. Transforming from a private to a public company does not in any way change the company’s privacy policies or give it the ability to claim your personal data as its own. According to the privacy notice hoax, if you do not re-post, then you are giving Facebook control of your posts and pictures, allowing them to do with as they please. That is just not true. The terms do go on to explain that Facebook does have the right to use and distribute users’ photos and posts, subject to applicable privacy settings. Basically, if you post something to the public, it is public and can be shared. If you have properly set your privacy settings, you should be safe. If you ever have any questions regarding the terms of service, they are always available at www.facebook.com/policies. Facebook allows you a variety of privacy settings that many users do not take advantage of or are simply unaware of. 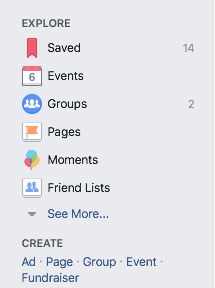 When you log in to your Facebook account, in the blue bar at the top, farthest to the right, you will see an arrow pointing down. Click this arrow and choose “Settings”. Here you will see many options regarding your account including your Privacy. In the Privacy Settings area, you are able to alter who can see your posts, who can contact you and who can look you up. Adjust these settings to something you are comfortable with. You can choose Public, Friends, Only Me or Custom. Custom is helpful if you have certain people you would like to keep as friends, but you do not want them to see certain posts. For example, if you don’t want your boss or co-workers to see your posts, you can create a custom setting preventing only certain friends from viewing your posts. For someone you would like to completely remove from your Facebook life, you have the option to “block” them. Utilized correctly, Facebook’s privacy settings can prevent a lot of unnecessary worry. If you have updated your privacy settings so that only friends can view your information, now is the time to make sure those you have “friended” on Facebook are truly your friends. If you are uncomfortable with any of your current friends seeing your posts or pictures, simply un-friend them or set your privacy more specifically so that those people cannot see your information. When you receive a new friend request, instead of just accepting, make sure you know the person and are willing to let that person into your circle of trusted Facebook friends. Accepting strangers as friends will give those people access to any of your information that is available to your Friends list, potentially putting you in danger of identity theft and other security risks. It is absolutely unnecessary to input all of the information that Facebook asks you for. The only information required to create a Facebook account is your name and email address; everything else is optional. To keep personal information away from the public, simply keep it off of Facebook. Facebook and your Facebook friends do not need to know your phone number, date of birth or address. Keep that information for those who really need it. On a regular basis, check out your profile page to see what information is being displayed. Look to see if others have tagged you in photos and un-tag any of those that you do not wish to show up on your page. Keep in mind that this does not remove the photo entirely, it just un-links you. If you want the photo completely removed, you will need to contact the person who posted the photo or else report it to Facebook as inappropriate. Facebook also allows you to view your page as if you were someone else with the “View As” tool. In the lower right hand corner of your cover photo, there are 3 dots. Clicking here will bring up the option to view your profile as the public or as a specific friend. This is a great way to see what information is showing up and to correct anything you are uncomfortable with. To protect your privacy as much as possible, there are a few other precautions. Change your password often and do not make it something obvious such as your pet’s name or mother’s maiden name. Also try to include a number, capital letter and/or symbol. Remember to log out any time you are using a public or shared computer. Do not post information that could put you at risk. For example, don’t post that you’ll be out of town and have a completely empty house for two weeks. Also, make sure your virus software is up to date to prevent unauthorized access to your personal information. Using Facebook and other forms of social media could potentially violate your privacy. Like other aspects of life where it’s best to be ‘better safe than sorry’, it is wise to practice abstinence. Taking proper steps to protect your privacy can make turn a potentially scary experience into a pleasant, rewarding one. Keep your information safe and private. Then, the next time one of these hoaxes appear, you will feel confident that the statements are illogical. When you question the validity of a post on Facebook, do some research before posting and perpetuating the hoax. Facebook is a powerful resource for real estate agents, especially with the plethora of free resources. Take advantage of business pages, scheduling posts, reviews, video profiles, groups, and all of the social network’s free resources. Once you’ve mastered the free tools, you can dip your toes into the possibilities available to you with Facebook ads. 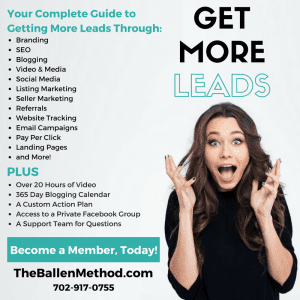 Ready to learn more about how Ballen Brands can become your lead generation team? 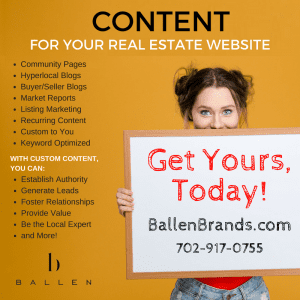 Reach out to us today at (702) 917-0755 or drop us an email at team@BallenBrands.com.